In this post you will see why getting the right MLM training is the difference between success and failure in this business. Are you dreaming high and searching for a way to grow your MLM ideas and skills? Do you have plans yet don’t have any clue where to start? Do you wish you had a successful MLM blog but right now you have lost hope to earn money from it? This was exactly the situation for me once, but since then I have learned the importance of a good MLM training, and I am sure you are going to see it as well after you read this post. “Why should I join MLM if so few people are actually getting money?”. I get asked this question a lot, and if you got to this page it is probably because you too have doubts whether it is the right decision for you to join MLM. I will share with you from my own experience so you will understand why I love this business, yet you will know why I don’t believe that it is right for just anyone. Anyone who takes his business seriously agrees that nothing is more important to your success than attending a real live marketing event. As far as I love the Internet, there is something magical that will never occur online: Nothing would equal the amazing personal growth, the great leverage and the huge momentum you can generate only at a truly live marketing event. Let’s try to understand why live events are so powerful. Do you have a Burning Desire to Win ?? If you have an home business you probabily already know how important it is to have a strong WHY and create a burning desire to win. Well, so do I, but the truth is, since I had started to get some success, I had never stopped to really write it down (even after all my sponsors and coaches explain how important it is and why I must have a burning desire to be unstoppable). Yes, we did it! We accomplished our goal in the last day of 2012 and in this post we are gonna show you 3 mandatory steps you require in order to be successful in any area you want in 2012! These are not just 3 suggested steps, but actually these are easy to understand steps, that if you do them, you will be successful and if you don’t… Like we planned, we have just broke the 200K rank in Alexa, and in this post I will give you some principles on how you also can be successful in whatever you choose. Have you ever thought what is the biggest obstacle to your success ? Well, let me give you a hint: If you can pass this, you probably will succeed, if you can’t, well my friend, sorry to say but you don’t have a lot of chance. Any idea ? It is sad that we are reminded to talk about someone only after he is gone, but I guess this is just the way things work. 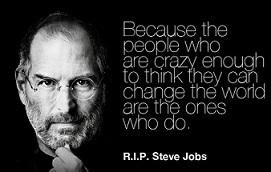 Steve Jobs died tonight, and there is so much to say about this giant entrepreneur. Some say that he was a crazy, perfectionist, who was a very hard boss that yelled over his employes.